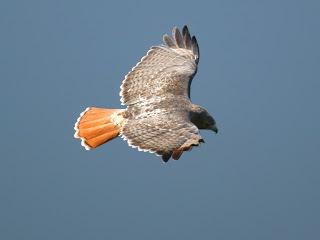 In the spring, I had donated a couple gift certificates for tandem flights to the Ojai Raptor Center (http://www.ojairaptorcenter.org/). The center rehabilitates and releases sick and injured birds of prey as well as other animals in need (I was introduced by my girlfreind Erin who volunteers there). Today I redemed a certificate, and Allen paid for his wife to fly also. We met at the “T” landing zone in Santa Barbara (the local club owns this property). We drove up to the Alternator launch 4000msl (about 3500agl) as the SE winds favored this over the usual Eliminator/Skyport launch. After the preflight briefing, Valerie (the fearless one; was nominated to go first) and I flew off for her first experience of free-flight. She manuvered us to the places I thought might have lift, but alas it wasn’t meant to be any more than a glorious sled-ride. I hadn’t really expected much more as the sky was overcast. I was slightly disappointed with our landing which consisted of 4 steps before she gently dropped to one knee; then she made a comment about our “crash” …really? The second flight was windier on launch and still a little cross from the East. Allen was eager to get his hands on the controls, so he flew until we found a bubble where I circled trying to maintain briefly. We glided on to a nice landing at the “T”. 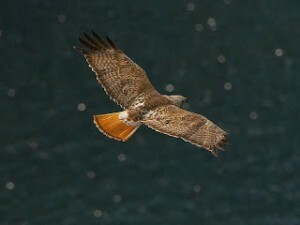 Both flights we enjoyed by all, and I walked away knowing I’d contributed to saving the same bird who “save” me.